Some primitive societies used shells or pearls as currency. In Mesopotamia and Egypt, they used gold bars, but these had to be weighed each time something was traded. The development of metal coins, which it is estimated took place between 700 and 500 BCE, standardized the concept of value and greatly simplified trade. Coins could now be counted without being weighed, making transactions much easier. When gold and silver coins began to be manufactured around 500 BCE, trade between one country and another became possible as these precious metals had a standard value. This allowed countries with a surplus of certain goods to sell these to other nations that needed them. Although the fundamentals of trade have not changed much since prehistoric times, over the last century the ways we carry out transactions have been entirely transformed. At one point, all businesses were small businesses: traders sold products to local residents or other businesses (for example, a general store in a small town in the early years of the 20th century). But the rise of big corporations led to the creation of chain stores and department stores. The 1980s saw the birth of superstores like Barnes & Noble or the much-dreaded Walmart. Smaller retail stores quaked when they heard that one of these superstores was opening up in their town. With their massive scale economies and low prices, superstores and hypermarkets forced many smaller shops to close their doors. But during the 1990s the pendulum began to swing back in favor of small retailers as the rise of e-commerce helped to level the playing field. 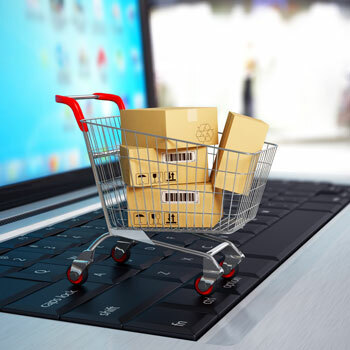 The principles of e-commerce were first established in 1960, when the Electronic Data Interchange (EDI) protocol was developed, making it possible to transfer data digitally from one computer to another. But security concerns prevented the widespread adoption of this tool until 1994, when Netscape developed Secure Sockets Layer (SSL) encryption. The first third-party services for processing credit card payments online emerged at around the same time, and VeriSign developed the first digital certificates for verifying an online company. In the mid-1990s, Amazon and eBay changed the face of e-commerce in the United States. The ability to find books based on different search criteria, receive personalized recommendations, and write reviews of purchases helped make Amazon popular among consumers. EBay, meanwhile, let people open their own online stores easily and securely. When the dotcom bubble burst in 2000, enthusiasm around e-commerce waned for a while. Sites like Pets.com had staked too much on people’s desire to buy everything online. But things never did go back to the way they had been before. In 2004, the Payment Card Industry Data Security Standard (PCI DSS) was established to guarantee that online businesses would meet the security requirements for financial transactions. This extra security made online shopping more attractive even to those who had previously had concerns about it. According to data from BI Intelligence, 40% of men between 18 and 34 years of age say that, ideally, they would like to buy everything online. While young men are among the most active online shoppers, women, baby boomers, and even the elderly now all make regular online purchases. Millennials, the generation born in the 1980s and 1990s, spend the most online both in dollar terms (an average US$2,000 per year) and as a percentage of their income (9%). As this generation gets older, their familiarity with e-commerce will shape the future of trade. For the first time ever, the sales of retailers in the USA that operate exclusively online, or e-retailers, outstripped those of traditional chains with brick-and-mortar stores, according to a comScore report. This gap is becoming ever wider as e-retailers’ sales are growing much faster than those of traditional stores via their websites. Online sales are expected to hit the US$400 billion mark in the next few years: Forrester Research projects sales of US$414 billion while eMarketer’s estimate is US$491.5 billion. However, a new countertrend has started to emerge, with e-retailers launching brick-and-mortar stores to satisfy consumers desires to see, try, and touch things before they buy them. NastyGal, Warby Parker, and Bonobos are among the e-retailers that have managed to add physical trade to their online business model. Indeed, a 2013 Accenture study suggested that 65% of online shoppers planned to research products online before going to a brick-and-mortar store to purchase them. Avoiding shipping costs (47%) and being able to touch products (46%) are the most common reasons for shoppers to visit a physical store. Of course, the reverse is also true. Many consumers visit physical stores to check products out and be able to touch them but then seek better prices online. The biggest change today is e-commerce via mobile devices (sometimes called m-commerce). According to comScore, the turning point was 2014: most interactions on retail e-commerce sites now take place on mobile devices. This doesn’t mean that most clients are actually buying through their phones (yet) but it does suggest they are looking at products and comparing prices on them. These trends mean that companies need to optimize all the channels their clients use to access them.